The Pelican™ 1610 Case comes with the unique Pelican™ Pick-N-Pluck™ foam. This foam is pre-cut which allows you to customize the interior by half inch cubes. Trace out the item you want in the case and simply pluck the foam out by hand, no tools required. You can customize your case in about 15 minutes. Unbreakable, watertight, airtight, dustproof, chemical resistant and corrosion proof. 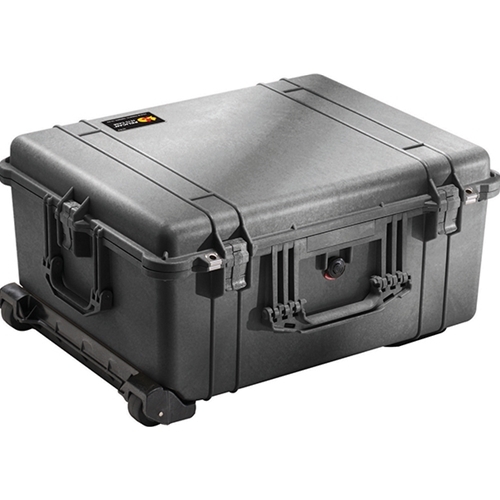 These are some of the features of this Pelican™ 1610 Case that offers total protection for your equipment. It is made of Ultra High Impact structural copolymer that makes it strong and durable. Its exclusive 1/4" (6.4 mm) neoprene o-ring and ABS latches seal perfectly and includes an automatic purge valve for quick equalization after changes in atmospheric pressure. It is equipped with 2" (5 cm) hard rubber transport wheels, a retractable extension handle and multiple fold down carrying handles. Your equipment can fit into the high density foam or padded dividers for total subjection and protection against impact, vibration or shock. The Pelican™ 1610 Case is another popular rolling case in the Pelican™ large case category. The length and width make it a great solutions for a number of different applications. Not too large to check in at the airlines makes it a good solution for traveling with your valuable gear. This case is tested to MIL C-4150J (Military Standard), IP-67 (Ingress Protection) and ATA (Air Transportation Association). Unconditionally Guaranteed ... forever. For over 30 years Pelican™ has built a reputation for manufacturing the toughest cases in the world. As a matter of fact, Pelican™ invented the category. Over these years we've seen our cases used for some fairly crazy activities...and important ones too. Pelican™ Cases have been thrown out of helicopters in Iraq, floated through frigid fjords in Norway and rolled over by SUVs in Tanzania. With only a few scratches to show on the outside, contents inside are left unscathed. These are minor details for major bragging rights. And that is really what it's all about. Getting your gear from point A to point B in the condition it's meant to be in: intact and functional. Because it might contain a large format camera that will shoot next month's magazine cover or a heart defibrillator that could save a person's life, you can't put a price on it.